Powered by a class-leading 4Ah 24V Lithium-Ion battery and with a typical run time of up to 85 minutes when using the hedge trimming head and 18 minutes when using the pruning attachment, it is around half the weight of a petrol-powered machine. 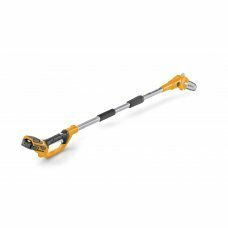 A truly versatile product, it comes with a 20cm chainsaw pruning head and a 51cm hedge trimming head and a 70cm extension shaft. The SMT 24 AE Pole Pruner & Hedge Trimmer is the ideal answer for gardens with difficult to reach bushes, trees and shrubs. It is lightweight, clean and easy to start with none of the hassle of petrol machines.